No, it’s not a scene from Quatermass. The looming lump of white fluff in the photo is…wool. Or more accurately, a pile of discarded fleece, dropped off by some kind neighbours who raise a small flock of sheep for meat. Once a valued commodity, this kind of wool is now worth so little that there is no real market for it – rather than chuck it on the bonfire, my neighbours kindly offered it to me instead. After a bit of rootling around on the web, I learned that wool can indeed be composted – in fact, I found a commercially available wool-and-bracken compost. Though as wool apparently takes ages to break down, I may have to find the fleece its own corner of the compost pile. 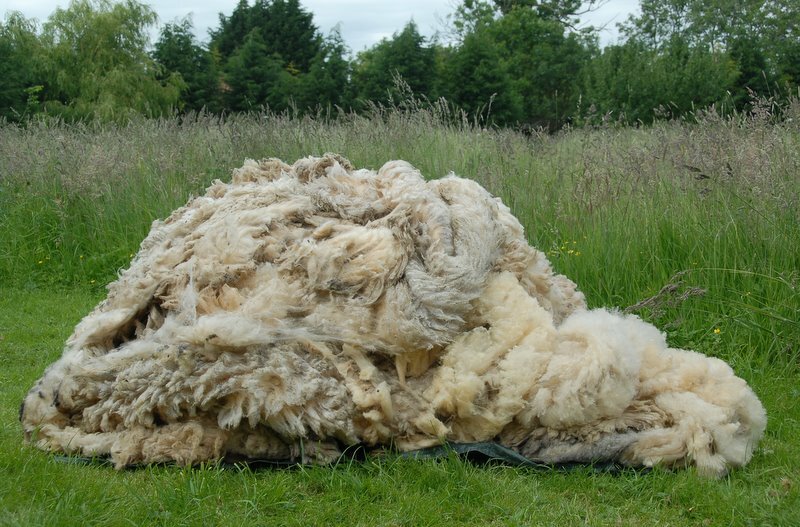 Given how thick the fleece is, I think it will also be great at suppressing weeds. I’ve put a load around a young pear tree that is being swamped by grass. It looks pretty weird, but once covered up by grass clippings, who’s to know? Our village school has also used some to line their new ‘bug hotel’, to make nesting material for critters. If none of this works out, I suppose I could always learn how to make the stuff into a jumper. If anyone has any other ideas, I’d love to hear them! I’m just wondering if you could card some of it for felting? I buy merino wool rovings for making felted pictures and there’s loads of stuff you can make from felt. Washed and fluffed, it would make a lovely filling for draught excluders or cushions, pin cushions or stuffed toys. At our local city farm they use the wool left behind on the fence for bedding for the baby animals. I think you’ve been given a big pile of treasure! Thanks for the ideas! I’ve never tried felting – I’m not very good at craft things…though I have made toys & cushions – that’s a great idea to use some wool for stuffing. Daft question I know, but what do you wash it with? The lanolin is incredible, it’s really greasy-feeling (in a nice way, bit like handcream!) – and seems practically waterproof. I guess washing up liquid might work…. It seems washing up liquid (Fairy original is best) is just the thing! oh and I love the description of it being a ‘big pile of treasure!’ Makes me happy when someone else’s trash can be turned into something useful. What about a layer of it in the bottom of a Hugelkultur bed? Many thanks for the idea, and sorry for the slow reply. I’ve a feeling that it might be tricky here… for one thing, we don’t have much spare wood. It’s not a woody area, and what we have, we use for the woodburner. Also, we’re on fairly heavy clay that holds water, and I’ve read that one of the advantages of Hugelkultur beds is that they soak up water like a sponge. But I may be wrong – and I haven’t tried it. Perhaps I should set aside a few logs and bung them into a heap with the wool – then plant it up and see what happens! When we had sheep we had a similar wool pile (I did keep some of it for spinning, but even with only 10 sheep there was way more than I could use for that). We used it to mulch our young apple trees. It must have done a good job because after they were planted they were never watered again, and survived at least two severe droughts in the first 5 years of their lives! You do need to make sure that the wool isn’t in contact with the trunk though, as it’s such a good water retainer that it can lead to rot. Thanks so much for the info…Brilliant to know that it works well. I hadn’t thought about it retaining water – that’s good to know, I was a bit worried that it might not let enough water through as it seems to thick and, well, waterproof!! Putting the wool in a bird feeder is a really great idea, thank you! We did find an empty wren nest (I think) blown into the garden last year, and it had a few bits of the wool in it that they must have found round the trees. I’ll definitely use your bird feeder idea this year. I’d quite like a lump of wool like that for insulation of our bee hive. Mane if you wanted to pass it on another time a bee keeper might be interested. Sadly, living in holland we’re a bit far away. I read somewhere that slugs do not like wool so am wondering if you could wrap a bit around the veg and flowers and it should help the soil. Use it as a filtering medium for a greywater system.